As a matched bettor, you may be wondering just what an each way bet is. And if you do know, your next question might be: “Is it possible to match each way bets at the exchanges?” The answer to the latter question is “Yes”, but there are some caveats to be aware of. First, let me introduce you to each way bets, (in case this is all new to you). Then, I’ll tell you about finding the place market when each way betting. An each way (EW) bet is actually two separate bets, which the bookies roll together. This type of bet usually relates to horse racing and many will know of it from those Grand National long shots and each way “punts”. You can also bet EW on other events too, like golf, for example. However, in this post, I’ll focus on horse racing. Each way bets consist of one bet on the horse to win and another on it to place. The phrase “to place” means finishing the race in one of the places the event is covering. (This includes first). The number of places paid out on by bookmakers in a specific event is shown at the top of their race card. Usually though, for horse races this is 3 places (but can be 2 or 4). For golf tournaments, it’s usually the top 5 players. To match the place part of the bet we would need to lay the same number of places at the exchange as we’ve backed with the bookmaker. At the exchanges this is usually known as the ‘To Be Placed’ (TBP) or ‘Place’ market. The exchange may offer other sized place markets, but will have the specific number of places at the top, so just be careful in choosing and comparing the right ones. The betslip above shows the bookmaker’s EW terms at 1/5 1-2-3. This means they are paying out on places 1 to 3, at 1/5 terms. The 1/5th (or 20%) means you get 20% of the win odds returned to you if the horse does place. To work this out manually, take the win odds of 17.00 and subtract the stake of 1 (16.00). Multiply that by 20% (3.20) and then add the 1 (stake) back on (4.20). This bookie will treat this part of the bet as £10 @ odds of 4.20 on the horse placing 1st, 2nd or 3rd. The win part of the bet is simply like a normal single and is a bet of £10 @ 17.00. The EW box on the betslip is ticked, meaning we want to place both bets and our £10 on each part of the bets. This means the total stake for this bet will be £20, as shown in the yellow confirmation box. and 2 x ‘lay’ bets: 1 in the ‘win’ market and 1 in the place market (on the betting exchange). To calculate the lay stakes required to be placed to match the above example, there is a handy EW Calculator within the tools available at OddsMonkey. Rather than enter two separate back/lay calculators, or even calculate those place odds manually it can all be done in the one place. Just enter the winning odds, your total stake and the place payout fraction, then the lay odds & commission from both the win and place markets. It will calculate the correct lay stakes for you to use and show the expected profit or qualifying loss (QL). I hope that’s a not-too-scary introduction to each way matched betting and finding the place market. If you’ve got any questions, just leave a comment below. The OddsMonkey Community always has lots of helpful members and support staff on hand to help out. See this post on the importance of a matched betting forum for more details. I will be continuing this series of articles on each way bets. In it, I’ll cover some of the other uses of each way betting. I’ll also look at how using OddsMonkey’s EachWay Matcher can help find matches and assess the value. This tool can also help reduce the time spent calculating odds. 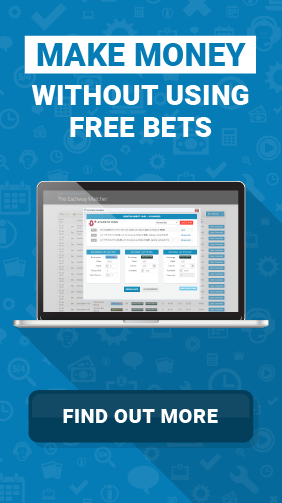 OddsMonkey offers a whole range of training and support options, including written and video guides, 1 to 1 sessions and a thriving matched betting Community. How about giving it a go?